We will bring you the latest and greatest videos that deal with shoes, handbags, jewelry, accessories, beauty, essentials and video! Check back often. We always want to hear from our readers (and viewers) about what's hot and happening in your fashion worlds. Send us an email to let us know what you're thinking, and we'll get one of our video crews out to cover your event, party or happening. 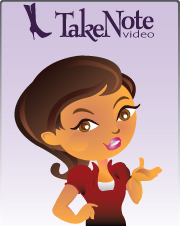 Our Take Note team has blogged about this video. We welcome yours as well. The School of the Art Institute of Chicago will celebrate the 75th anniversary of its annual Fashion Show on April 23 and 24, in the School’s recently opened and acclaimed Sullivan Galleries (entrance for these events at 36 S. Wabash Avenue). For the first time in its storied history, the Fashion Show will be presented within the installed space of SAIC’s annual Graduate Exhibition, moving the “runway” away from the catwalk and into the Galleries’ open spaces, and creating a vibrant relationship between the work of the School’s graduating artists and designers and fashion students. Over 200 innovative garments will be showcased during this multimedia celebration of creative clothing and contemporary art, which will also feature specially commissioned works by students and faculty from the School’s Performance department. A special preview fundraiser, The Walk 2009, will be held the evening of April 23, honoring designer and alumna Maria Pinto (BFA 1990), known widely as a favorite of First Lady-to-be Michelle Obama’s. Guests will be the first to see this year’s show and enjoy conversation with the designers, cocktails, and hors d'oeuvres. SAIC Fashion Show 2009 2. The success of the School’s Fashion Design program and SAIC’s trans-disciplinary approach to education is reflected in a list of alumni that includes such notable designers as Halston, Cynthia Rowley, Laurence Steele, J. Morgan Puett, Eunwha Kim, Maria Pinto, Gary Graham, and Matthew Ames. SAIC graduates hold senior design positions in firms as varied as Yeolee, Jones New York, Levis, Nike, Charles Chang Lima, and Tommy Hilfiger, and design for Anna Sui, Calvin Klein, Zac Posen, Betsey Johnson, Triple5Soul, and Moschino. Upon graduating, many have chosen to intern for international houses such as Victor & Rolf, Alexander McQueen, Wendy & Jim, Castelbajac, Zac Posen. Threeasfour, and William Ivey Long, or to launch their own fashion lines.